The situation in today’s world is deteriorating at a very fast pace and unfortunately the reason behind these circumstances are some Islamic groups. Even the leaders of the Islamic countries do not understand that the powers against Islam are trying to capture them in their traps. The atrocities being conducted in the name of Islam and Jihad have no link with the teachings of Islam. Similarly the injustices being committed by the governments do not relate to Islamic teachings even in the remote sense. Where is it written in Islam that you may kill innocent people? These people who are portraying wrong meaning of Islam are not only in the name of their religion killing the non-Muslims but more than that they are killing the Muslims. This includes very innocent Muslims such as children, old people, men and women. The power of the Muslim countries is diminishing very rapidly and this is a fact, which is the ultimate wish of anti-Muslim countries. They desire that Muslim countries shall never be able to become strong financially or in the sense of peace and harmony. The leaders of the Muslim countries and the religious teachers (who are being supported by them) do not understand the true Islamic teachings nor do they want to understand them. They completely deny the one who has been sent as the Imam of this age, the one who was sent according to the promise of Allah Almighty and according to the prophecies of the Holy Prophet (blessings be upon him). They reject the man of God who was appointed for this age in order to introduce the Islamic teachings in today’s world. The result is that as I have mentioned that Islam which is the religion of peace and justice, the greatest flag bearer of this message and urges to the Islamic countries to establish peace and justice (which is the greatest of the responsibilities of the Islamic states) are the people and the governments who are destroying the peace throughout the world. The disorder that you see in every Islamic country in today’s world and the people who have their own objectives benefit from those hostile conditions is mainly due to the governments that prefer their own interior motives instead of working for the betterment of the people. Muslims are killing Muslims. The rate of tolerance among the leaders has diminished. The recent attempted coup in Turkey cannot be justified according to the Islamic teachings even the actions that are now being taken by the government are based on cruelty. The action being taken against all the opponents of the government whether they had a major role in the coup or not. This act of the government will bring adverse effects now and later. The anti-Islamic forces will try their best to exploit it. The terrorist organizations in the western countries are killing innocent people and are undertaking extremely brutal steps that have brought bad name to Islam. This may be true that in order to defame Islam these anti-Islamic forces in foreign countries are responsible for all these brutalities in order to bring bad name to Islam. These countries in the name of aid and in the name of protecting the people from terrorism may be able to get an excuse to get a strong hold in Islamic countries. If they are aware of the true Islamic teachings then they should have known that there is no such Islamic teaching that allows killing of innocent people. It is not at all allowed that passengers are killed on airports/bus stops or the children/women/elderly/patients and worshipers at churches should be slayed. When the Holy Prophet (peace be upon him) used to send his army for jihad they were under strict instruction that the children, women, old people, passengers, trees and religious leaders should never be killed. And every person who does not take up the arms or in any formal shape is not part of the fighting against Muslims shall not be harmed. So this is neither the Quranic teachings nor teachings of the Holy Prophet (peace be upon him). Furthermore it is not justified by any of the actions of his caliphs and companions. Allah Almighty has given our religion the name of Islam which rejects the whole concept of terrorism and extremism. Instead it gives message of peace and harmony as the literal meaning of the word ‘Islam’ itself is to give peace and/or to live in peace. The people who have become unjust and do not believe in the teachings of Islam nor follow them will not earn the blessings of Allah. They have invented their own religion and Shariah. Anyways, when a true Muslim believes and he begs for peace and security and offer prayers, he is ultimately protected from mischief and evil doings. Allah says that the prayer stops you from obnoxious and unpleasant doings. Islam teaches that you spread the message of ‘salam’ and give this blissful message to other people. To say salam is not only limited to the Muslims. However, the situation in Pakistan is different. According to the law of the land that is under the influence of the religious leaders it has been brought under the control and monopolized that only the Muslims be allowed to say Salam and other minorities or Ahmadis are not allowed to do so. During the time of the Holy Prophet (peace be upon him) salam was being said to everyone irrespective of any discrimination on the basis of religion or ethnicity. Some of the qualities that have been mentioned about Islam are for the purpose of establishing peace. If you go into details and look through any angle and commandments to discuss the religion of Islam it is found to be the religion of peace, harmony and good will. It does not promote terrorism. Islam can only be spread in the world through its beautiful teachings and not by the self-made teachings of the extremists and religious teachers. This path can only be shown by a person who has been made the Imam of this age. Justice can be established only by the person who has been sent to establish the justice and he has been sent as the right and just person to decide. He can enforce the true teachings of Islam because it is he who has been appointed for this position. We the Ahmadis are very fortunate that we have believed in the Imam and Mahdi of this age and thus have been protected from the atrocities of the world. Promised Messiah says that Islam has divided its teachings into two parts. First,the duties towards God and then duties towards the people. Duty towards Allah is to believe in Him and be obedient to Him. While the right of people is that one should be very kind to other human beings. This is certainly not right that someone be hurt or harmed due to the difference in religion. To be kind to one person is one thing and the difference in religion is another. Those who misunderstand the concept of Jihad they have also made it lawful that you can plunder the wealth of non-believers. Promised Messiah (peace be on him) says that even regarding me they have given the edict that my wealth can be plundered. This fatwa and decree is given even in today’s time in case of Ahmadis. They have given the fatwa that wealth can be taken away. Their wives can be taken away.While the fact is that such impure teachings are not found in Islam. Islam is pure and fair religion. An example can be given that just like a father admires the rights of being the head of the family. Similarly he wants that every person in his family be treated with kindness. Allah does not like that people should be killed. Islam says that no partner shall be associated with Allah and all human beings be given the message of harmony and mutual love and affection. Unity must be created. These are the teachings of Islam that if followed by the Muslims, they can surely once again establish the glory of Islam in this world. They should recognize the rights of God and of one another. They should also establish harmony and love between people irrespective of their religions. Instead of using unjust practices and killing of the innocent people, they should spread the true teachings of Islam. They should win over the hearts of people and bring them towards the remembrance of God. Instead of earning the wrath of Allah by doing injustice and harming other beings, they should earn the love of Allah. Islam should be treated just like the love and kindness of the parents. It shouldn’t become a source of tyranny and harm that further provides opportunities to the opponents of Islam. If they don’t resist from such evil doings than they must remember that worldly methods and tricks cannot spread the message of Islam in today’s age. We Ahmadis should also remember that every attack which is done in the name of Islam by such people should make us fulfill our responsibilities with more zeal and zest. We should work towards our tasks with more interest than before. After every such action that brings defame to Islam, we should tell the world that the foundation of my religion is on peace. If among the followers of Islam there is somebody who does something that destroys peace and harmony of the religion then that person or that community has got something personal or to achieve their personal benefits. It is not the teachings of Islam even in the remotest way. The responsibility only falls upon the wrong doers and religion Islam shall not be blamed for it. It is the blessing of Allah that Jama’at Ahmadiyya is working very hard for this objective throughout the world and now by the Grace of Allah a very good impact is being created through the media, which is also admitted by various column writers. After the brutal killing of the priest in France one of the writers has written that this action draws attention to the fact that religious war has already started in the world. Then he himself writes that however, this is not reality. It is actually the war started by people who in name of Islam are trying to get the benefit and of the people with mental disorders. The pope has also issued a good statement that there is no doubt an international war but this is not a religious war. Instead this is the war of self-benefit and war of those people who want to achieve their own objectives. This is because there is no religion that teaches injustice. However now our responsibilities have increased many folds with the increasing injustice that with no doubt create reactions. We should spread the message of Islam everywhere and to every person. Anyways, on one side this is the situation. There are some people who have got our message but people are trying to give it a negative meaning. Somebody wrote to me that someone who has left Islam using my reference posted a message on twitter and perhaps put my picture as well that Islam is the religion of peace and Holy Prophet (peace be upon him) has forbidden injustice and brutality. But then he has also added his comment to it that this instruction is not for women and for people who have abandoned Islam. There are some people who show up by doing such acts and this is because they want to dilute the positive impact that is being created by us and when they witness others being influenced by our peaceful message of Islam. This method that is very common these days such as Twitter and Facebook and through various other methods is adopted by many to spread the message. We have to keep an eye on such people and also respond to these. There is so much work to be done to convey the true message of Islam to the entire world. Although a good introduction has been made by Jama’at but still we cannot say that it has been done to a satisfactory level. This period of opposition which is the opposition of Islam from the non-Muslims and by the opposition of Jama’at, in this situation we need to go with wisdom and understanding. There is no doubt that Islam is that religion which is bound to spread in the World Inshaallah. There is no doubt that the revival of Islam will take place through Ahmadiyyat Jama’at and community .This is what God Almighty has decreed and destined. But it is our duty and responsibility that we should pray that these examples of progress be shown in our lives and our shortcomings and weaknesses and negligence should not be taking us away from this victory and success. For the sake of our own forgiveness and to get the blessings of Allah we need to pray more and more. The Anti-Islam forces along with the so called followers of religious teachers are against us but we have to remove every sort of fear from our minds and we have to complete the mission of the Promised Messiah (peace be on him) by doing everything possible by us. Now in some places the journalists and reporters they question about this issue. During the last visit to Sweden this question was raised that you are being opposed by the extremists and your lives are in danger so how will you perform your duties. However no doubt there is this fear and the members of the community have the same fear but these fears cannot stop us from performing our duties. This danger is everywhere and for everyone. As you said it is dangerous for you. 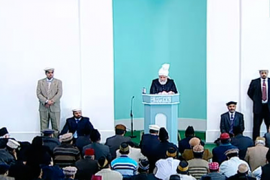 There is no distinction between Ahmadis and non Ahmadis. Everyone who does not work according to the will of these extremists who are working for their selfish objectives and who does not agree with them are surely in danger. But Ahmadis are being opposed even by the nationalists or those who are against Islam. So we have fear from both ends. But anyways the true believer does not care about these things and is very firmly established in faith. Inshaallah every Ahmadi will remain so! Keeping in view the current situation of the world, every Ahmadi needs to be protected from the evil. Therefore, we have to give immense importance to prayers and charity in order to be protected collectively as a community from the mischievous doings of these people. Particularly in these days we need to pay attention because the condition is becoming worse with every passing day. May Allah Almighty protect us from these mischiefs and from those who are doing injustice in the name of Islam. By doing so they are defaming and bringing bad name to Islam. May Allah capture these people and punish them. May Allah remove all our trials and difficulties. Holy Prophet (peace be upon Him) has drawing attention towards prayers. At one occasion he said that the person for whom the door of prayer has been opened, then surely for him the doors of mercy have also been opened. Whatever you seek from God, out of all those things the greatest thing which is pleasing in the sight of Allah is to come into the protection of Allah. And then the Holy Prophet (peace be upon him) has said that the prayer at the time of trial that has already come and also against that trial which is to come in the future it is always very beneficial. The servants of Allah it is compulsory upon you that you always adopt the course of prayers (dua). At one occasion he said that in the sight of Allah there is nothing more honorable than prayer. Dua is the most honorable act in the sight of Allah. Holy Prophet (peace be upon him) regarding the charity said that for the protection from fire you must always give charity and giving charity in the way of Allah (sadqa) is obligatory upon all Muslims. The companions asked that if somebody doesn’t have anything than what one should give in the name of charity. Holy Prophet (peace be upon him) said that then he/she must act upon the teachings of Islam. Live according to the code of Islam and do good things and abstain from bad doings. This will be the charity from him on her behalf. But this does not mean that somebody should take it in the context that if he/she has given monetary charity then they are not on the obligation of doing good deeds. And thus do not abstain from bad things. However, this should not be the case. This is the mercy of Allah Almighty upon His servants that if something is beyond their control and they do not have money to give charity then if that person does good acts and refrain from wrong doings, it will be regarded as charity on his/her behalf. Otherwise if he doesn’t act upon that and doesn’t abstain from vices than his financial charity will be meaningless just like the prayers done for showoff do not carry any weight and are thrown at the face of the person performing them. Similarly such a monetary charity is not accepted and has no value for Allah. It is expected from a true believer that when he gives the charity and prayers to Allah then he/she should try to live according to the commandments of Allah. When this condition is there then the person is able to absorb the blessings of Allah and is protected from trials and difficulties. Regarding this Promised Messiah (peace be on him) said at one occasion that charity and prayers remove difficulties. And regarding the condition of the prayers he says that for the acceptance of the prayer it is essential that a person should bring about a pious change in him. If he cannot abstain from vices and breaks the boundaries of Allah Almighty then there will be no benefit in the prayers of that person. So while remaining within the limits prescribed by Allah we should pay attention towards prayer and charity so that we may be able to absorb the blessings of Allah. Promised Messiah (peace be on him) while drawing the attention towards prayers says that I always pray but you should also do the same. That more we indulge in prayers in prayers and do good for repentance Allah will protect you. If in the house there is one person doing so, Allah will protect other family members. He said that people who have a very special faith, Allah turns towards them and protects them Himself and Allah Almighty does not betray a truthful person at all! And He does not leave him alone. If all the people strand him they cannot inflict any harm to him. Allah is Almighty and is all powerful. The person with the blessing of faith comes under the protection of Allah and he will see the wonders of His Might and disgrace will never come to him. Remember Allah is the Mightiest of the Mighty and is Mightier than anybody else. Allah has control over His own commands. Offer the prayer whole heartedly and busy yourself in it and give the same teachings to your family members and relatives and turn to Allah whole heartedly and entirely and no one ever suffers who does like that. You turn to God completely and will never suffer any harm. The place of loss is the lack of faith and there is a need that a person should pray to Allah Almighty and Allah will remove all the difficulties and make the enemies frustrated and unsuccessful. Promised Messiah says that a person requires two things in order to gain personal welfare. One is that in the limited life the problems and the difficulties that he confronts in this life he may be protected from them and secondly the spiritual deceases and evil doings that take a person away from God he may be delivered from those. The goodness of this life is that whether it is physical or spiritual, all the trials and the filthy life one maybe protected from that and the aspect of life after death is the same thing. If worldly goodness is granted to a person then this will benefit him in the life to come and regarding the protection from fire he said that it is not the fire that will be on the Day of Judgment but there are many other fires in the world such as worries, fears, dealings with family members or some other difficulties. So a true believer prays than he shall be protected from all sorts of fires. This prayer should be recited regularly. There are so many other prayers in Holy Quran that should be recited to gain mercy from Allah. As I said that Promised Messiah has said that Allah has mentioned these prayers in the Holy Quran with the purpose that we recite them regularly and whole heartedly so that may Allah accept it. He said that Allah has put it in my heart that this is the magic word and anybody who would offer this prayer will be delivered from all types of trails and difficulties. May Allah enable the Jama’at, the community and collectively everyone from all types of harms and all attempts of the enemies may be turned upon them and they may be able to hear the call of the Promised Messiah sent by Allah and by becoming one community they be able to establish and spread the true message of Islam in the entire world. After the prayers, Huzoor led three namaz-e-janaza in absentia of Evon Bernaan Sahib, Syed Nadir Sayeedain Sahib and Nazir Ahmad Aya) Sahib (President of New York Jama’at). Inna Lillahi Wa Inna Ilaihi Raji’un. After the prayers, Huzoor led three namaz-e-janaza in absentia of Evon Bernaan Sahib, Syed Nadir Sayeedain Sahib and Nazir Ahmad Ayaz Sahib (President of New York Jama’at). Inna Lillahi Wa Inna Ilaihi Raji’un.